Yay, a new creation and a nice one at that! Thanks, Mustang! So simple, yet so beautiful. Thank you, Scott. How great can Máiréad look! Awesome wallpaper! She has such expressive looks. Purple suits her. Thanks, Mustang. My newest... inspired by a pic that Moscapoet posted a few days ago. Whoa!!!!!!!! Happy to help! Talk about a super moon! So glad you're doing more graphics of her. You can't ever have too many! Has it really been this long since I last posted a Mairead wallpaper? I have neglected her much too long. So here is my newest! This one is hilarious . You should Tweet it to her (or send it some other way); I'm sure it would put a smile on her face. Another amazing work of art, Scott. Normally celebrity endorsements don't work on me. 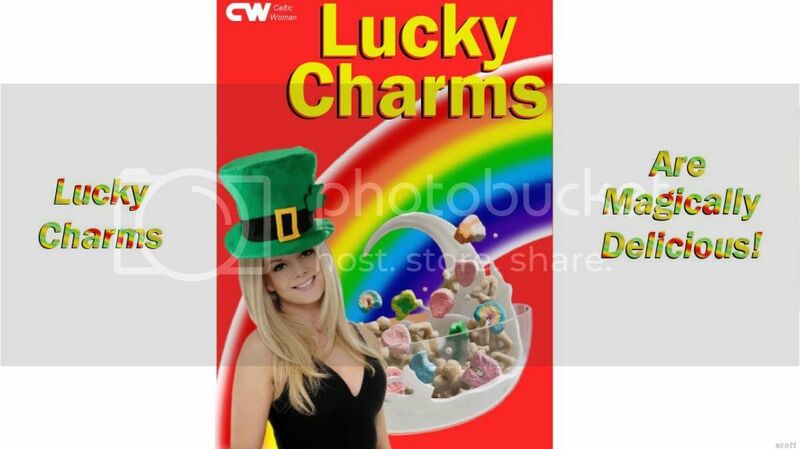 But seeing Mairead on that box...I'm tempted to go out and buy some lucky charms .